Well, it was obvious when I finally saw all the work that Ashley and her Mother Carla had been doing over the past year that this was going to be one spectacular wedding! You definitely could tell that Carla was in the event business and brought in her “A team” to make her daughters fairy tale wedding come true. Everything from this wedding looked like a staged photo shoot. Let’s start with the flowers. OMG! Isha Foss was her florist from Virginia Beach. The richness of the color palette used for the flowers along with ribbons hanging from each bouquet were so elegant. 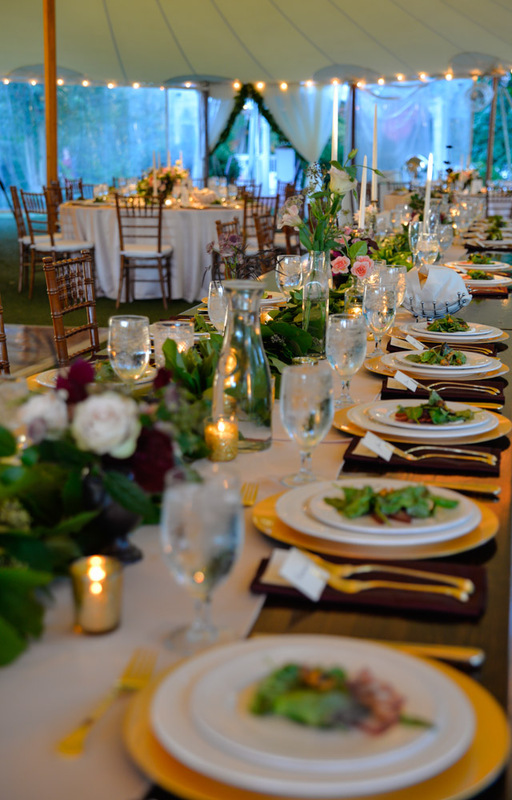 Isha draped the entrances of the Sperry tent with greenery also just to add more loveliness to the tent. The centerpieces were highlighted with spot lighting. At night the tent just looked so beautiful with those centerpieces popping under the glow of the tent. My pictures just don’t do it justice. Now, how about the bride, groom and wedding party? Breathtaking! 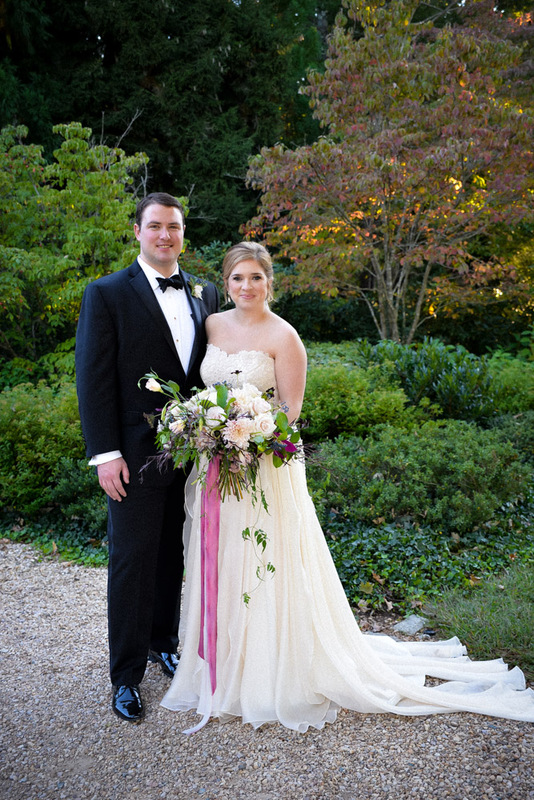 Ashley’s handmade dress from Italy had that whimsical fairy tale feel to it. I just wanted to see her running through the vineyard. The guys were so handsome in their black tuxedos. The bridesmaids, in their gold tone gowns with those gorgeous bouquets, just spectacular. Like I said earlier, photo shoot material all the way! Lets not forget about the food. Harvest Moon Catering did an awesome job by providing a variety of food stations for guests to explore through out the tent. One of my favorites that tortured me for hours smelling was chicken in waffles with a honey mustard sauce. I forgot how wonderful waffles cooking smell. Another delicious dish was shrimp and grits. Yummy! But probably the best thing from this wedding was the wedding cake and desserts. Why? Well, Ashley’s Mom, Carla, owns a bakery in Virginia Beach and she personally made the wedding cake plus the 120 miniature cakes for the guests. How special is that for both Ashley and Carla? Just as good as the wedding cake was the macaroons made by Hummingbird Bakery. Finally, the guests got to enjoy a brandy bar and cigars while dancing the night away with DJ Roger Cruz from Virginia Beach also. I can’t wait to see Photographer Rachael May’s photos from this wedding. I’m sure we will be seeing them in magazines! One final thing, I’ve never seen this before at any of our weddings, at the end of the evening guests were told to leave the tent for a sparkler departure. 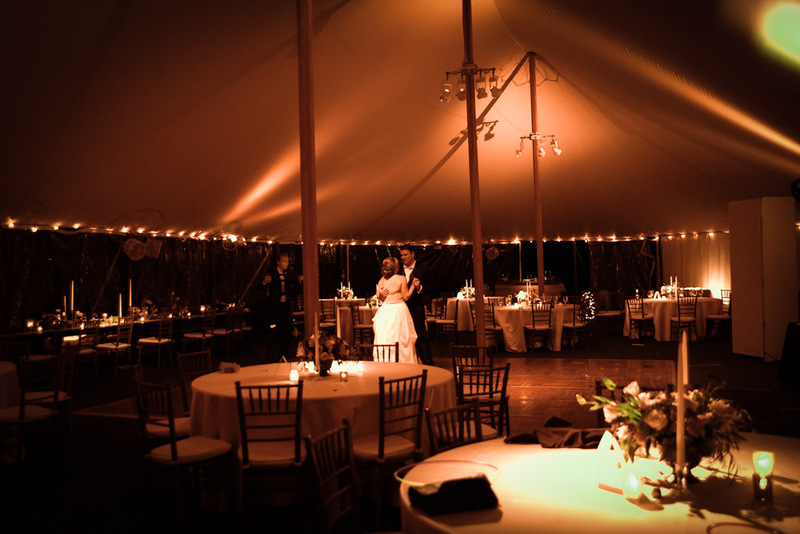 Once the tent was empty, Ashley & Jim shared a private moment together under the spotlight on the dance floor for one last dance, just the two of them. Isn’t that great? What a wonderful way to end your wedding day. Special thanks to the following vendors for making this wedding dream come true: Wedding Planner Lindsey Hocker of Simply Perfect Events (out of Virginia Beach) and assistant Lauren Dunn, Harvest Moon Catering, DJ Roger Cruz of Astro Entertainment, Photographer Rachael May, Video by Caleb from East West Production, Florist Isha Foss, Transportation by Ambassador Limousine, Musician for ceremony & cocktail hour Plum Blossom Quartet, Hair & Make-up by Ave 42, Desserts by Just Cupcakes.